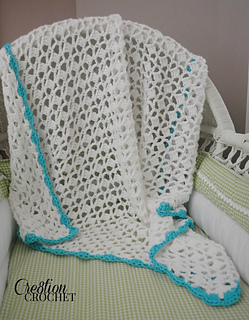 This pattern is also available for free on the Cre8tion Crochet blog. This blanket was designed for my new baby, Orazio Vincent Eppolite. Orazio joined our family on 06/18/14. Since he was a summer baby I wanted a blanket that would be lightweight and breezy, but would still keep him warm in the car with the air conditioning on, or in the house, since we like it a bit cooler. At the same time, I wanted a fabric that would breathe and wouldn’t become too warm. The Orazio blanket was the perfect solution. It is made with 100% cotton and has an open lace stitch that lets air move through and not overheat. 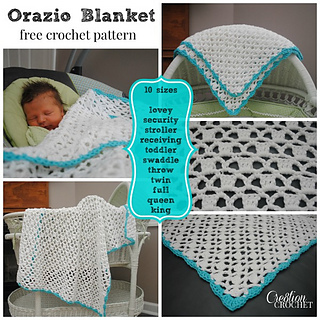 I designed my blanket in stroller size as it worked the best for us for both the home and on the go but you can make this blanket in any size. Next, I’ll be making one for my daughter’s bed in twin size. Pattern includes directions for TEN sizes. Enjoy!